Mercedes-Benz driver Bruno Spengler was also overjoyed. On the penultimate lap of the race, he overtook Mike Rockenfeller after a great duel and still ended up second. Thus, the Canadian prevented a 1-2 for Audi. Spengler remains in the lead of the drivers’ standings and now has a total of 47 points. “My car was perfect and I noticed that Mike was having some problems. Then he made a mistake and I was able to get past. I had bad luck in qualifying, but today, I had luck. Eight points are a great score after fourth place on the grid”, said a happy Spengler. In an action-packed race, Timo Scheider showed a great recovery with his Audi A4 DTM, moving up four places to finish fourth. His fellow Audi driver Martin Tomczyk, Spengler’s main rival in the battle for the title, converted seventh place on the grid into fifth place at the finish. The best-placed driver of a 2008-spec car was rewarded with four points. In the drivers’ standings, Tomczyk is seven points down on Spengler. Scheider is ranked third with 29 points. British driver Jamie Green had a poor start and dropped back from second to sixth place. That was also the position in which the Mercedes-Benz driver crossed the finish line. DTM rookie Edoardo Mortara (Audi) from Italy was classified seventh and thus scored championship points for the third time this season already. The two ex-Formula 1 drivers Ralf Schumacher and David Coulthard (both Mercedes-Benz) caused discussion at the start of the race. After two subsequent collisions, Schumacher retired, Coulthard crossed the finish line in 17th place. The stewards gave both drivers a penalty, suspended for the next race. In case of a further infringement, the driver involved will be dropped three places on the starting grid for the following event. 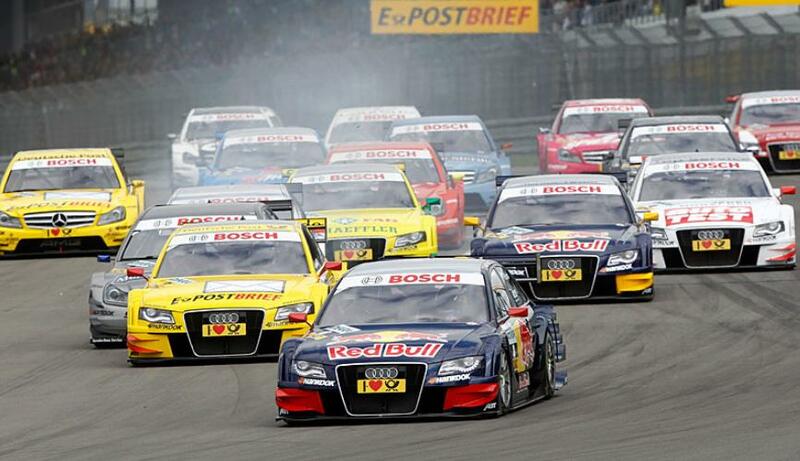 A total of 86,500 spectators attended the DTM race weekend in the Eifel. The next stop for the 18 DTM drivers is at Brands Hatch (GB) from September 2nd till 4th.